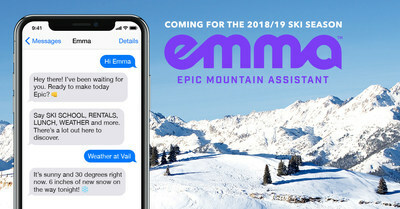 Vail Resorts Introduces Emma, Your Epic Mountain Assistant, the World's First Digital Mountain Assistant to Provide Real-Time Information to Skiers and Snowboarders | Vail Resorts, Inc.
- Emma, Your Epic Mountain Assistant, is the world's first digital mountain assistant to offer information on everything from grooming, lift line wait times and parking to recommendations on rentals, lessons and dining options. - Guests will instantly receive expert, local information tailored to each resort and to their needs. - Emma builds on the Company's long track record of seamlessly using technology to improve the guest experience without impacting their connection to the outdoors. BROOMFIELD, Colo., March 13, 2018 /PRNewswire/ -- Vail Resorts, Inc. (NYSE: MTN) today introduced Emma, your Epic Mountain Assistant, the world's first digital mountain assistant to help guide guests while on their ski and snowboard vacation at nine of the Company's resorts. Emma is an interactive mountain assistant who uses artificial intelligence (AI) and natural language processing (NLP) to answer a wide range of guests' questions about their ski vacation. Emma will debut for the 2018-19 winter season at Vail, Beaver Creek, Breckenridge and Keystone in Colorado; Park City in Utah; Heavenly, Northstar and Kirkwood in Tahoe; and Whistler Blackcomb in British Columbia, Canada. Through short message service (SMS) text, Emma answers guest questions in real time. On-demand information can be accessed 24 hours a day, 7 days a week, resulting in instant service and a seamless experience for guests from exploring a resort's village to learning if a favorite slope is groomed to recommendations for the best après-ski location. Topics such as snow conditions and lift line wait times, parking and in-resort wayfinding, ski school, lift tickets and equipment rental options, on- and off-mountain dining and activity recommendations and more can be accessed through Emma. From planning a ski vacation to arrival and all the way through to departure, Emma offers guests an unprecedented breadth of information tailored to each resort. If Emma cannot answer a question, she will seamlessly connect guests to chat with a live agent for further assistance. As Emma interacts with guests, her knowledge base and insight will continue to expand through both human and machine learning. Emma will be launched as an "alpha" version to a very small community of users this March to prepare for her debut in the 2018-19 winter season. Future generations of Emma may include integration with Facebook Messenger, voice assistants like Alexa, wearable technology notifications and Vail Resorts' groundbreaking EpicMix mobile application. "At Vail Resorts, we are committed to delivering an experience of a lifetime to each one of our guests and that means giving them the information they need, when they need it in order to plan and fully engage in the experience while at our world-class mountain resorts," said Rob Katz, chairman and chief executive officer of Vail Resorts. "As we have done before with EpicMix, we can use cutting edge technology with Emma to improve our guest service without detracting from their connection with the incredible natural beauty of our resorts or the personal engagement provided by our passionate employees." Emma is the latest among many of Vail Resorts' technological firsts in the mountain resort industry. As Vail Resorts celebrates the 10th anniversary of the Epic Pass, the Company is also looking back on more than a decade of service innovations, which provide new ways for guests to connect with the resorts and interact with family and friends. "Vail Resorts continually enhances the guest experience across our mountain resorts through innovative firsts," said Robert Urwiler, chief information officer for Vail Resorts. "Emma is the first application of AI and NLP in the mountain resort industry and will offer our guests access to information that is authentic to each resort. Through innovations such as Emma and many others, we continue to pioneer new guest service standards for the mountain resort and leisure industry, using state-of-the art technology to seamlessly improve the guest experience." Vail Resorts, Inc., through its subsidiaries, is the leading global mountain resort operator. Vail Resorts' subsidiaries operate 11 world-class mountain resorts and three urban ski areas, including Vail, Beaver Creek, Breckenridge and Keystone in Colorado; Park City in Utah; Heavenly, Northstar and Kirkwood in the Lake Tahoe area of California and Nevada; Whistler Blackcomb in British Columbia, Canada; Perisher in Australia; Stowe in Vermont; Wilmot Mountain in Wisconsin; Afton Alps in Minnesota and Mt. Brighton in Michigan. Vail Resorts owns and/or manages a collection of casually elegant hotels under the RockResorts brand, as well as the Grand Teton Lodge Company in Jackson Hole, Wyo.Vail Resorts Development Company is the real estate planning and development subsidiary of Vail Resorts, Inc.Vail Resorts is a publicly held company traded on the New York Stock Exchange (NYSE: MTN). The Vail Resorts company website is www.vailresorts.com and consumer website is www.snow.com.